Humankind and the Supreme Being want the same thing: Peace. But human methods and God’s methods to reach this goal are totally opposite. I’m interested in giving you and Galacti an overall picture: The ‘Coherent Completeness’ theorem. The Explanation of the ‘why, what, when, where and who’. A coherent complete summation of what the Powerful Being is planning. Galacti is nodding, because he relates to theorems. He, and you, can take my explanation, run it through the wringer and see if it holds water or not. Maybe it’ll help you see (or not) the value of the Supreme One and His Words. If you don’t understand why I’m talking about a s/Supreme b/Being and such ‘sacred revelation,’ then I suggest you read this about extra-human information and sacred books. A key point I want to share with you: I don’t go to a Church, Synagogue or Mosque, I’m not religious or practicing and have no intention of telling you to become this or that, go here or there, or even do this or that. At the time of my original Bible study in 1967 I was alone, not following any group or individual, it was me, myself and I, an independent doing an independent study. Today as I sit here in a small apartment, where I’m spending a few days writing in Cannes (note: this goes back a few years), I’m also an ‘independent’. I don’t owe anything to anyone (in that sense), belong to anything or practice anything. That said, I’m not an agnostic anymore. I put the puzzle together between 1967 and today. This book is exposing bits of the puzzle, little by little. They are not intended to be ‘proofs’. Galacti doubts this: haven’t we just explored science together? Isn’t that all about theorems and proofs? ‘It’s much more about free will’, I say. ‘In my approach, you see if the pieces fit together, you do with it what you like, you take it as far as you want to go’. ‘These flickering images I see, are they part of the puzzle?’ Galacti asks. ‘A cross, a Buddha, a Star of David, a mandala, various denominations that call themselves Christian’. ‘Without story, the images are meaningless’, I say. ‘And to me, there’s only one story. I’m going to run the reel, press the Play button and show the film. Reality is stranger than fiction. We’re going to tell an untold story: Coherent Completeness’. ‘It’s much more. It’s the beginning to end story of Humanity’, I say. ‘The larger picture and infrastructure that transform the pieces into a picture of why Humankind is on Earth’. This is an interactive experience in some respects. As we go through this, keep in mind our overall goal, the quest: How to establish ‘peace and prosperity on earth’. This can be stated in many different ways depending on how far we want to take this concept. For instance, ‘Goodwill amongst all men’. The term ‘Salvation’ both in a physical and spiritual sense would sum it up for some. Putting it another way, if we were to ask human beings, no matter what their state or rank in life is, what would you wish for humanity? We can poll all the nations of the world instantaneously, and I hear the answers coming in now. The response from the globe: ‘Harmony!’ ‘Prosperity!’ ‘Health’. ‘Happiness’. ‘Fulfillment’. ‘Let’s apply the most favorable motives to politicians, scientists, teachers, doctors, administrators and simply say: this is the kind of world they want to build. Each decision, parliamentary law is to advance towards this goal’. ‘But, Sam, you have just been saying the world doesn’t look like that’, Galacti says. ‘There’s a reason for this’, I answer. ‘If we could sum it up in a short phrase, how about this: The Plan of Humanity. Human propositions to attain this ambitious objective. Can we say that this is what our world leaders are out to accomplish? In other words humanity is out to accomplish exactly what the Supreme Being wants to do: The Plan of this Being. We’re going to see this theme over and over again… On the one hand, a Human Plan and on the other hand a Supreme Being’s Plan. Both with an identical goal: Peace and Prosperity, in the largest sense possible to include body and mind, physical and spiritual, men and women, families and nations, individuals and the whole world, even the universe. However, Human methods and the Supreme Being’s methods are different! This is the essence of the book we now see before us. It’s reflected in the story of Genesis’. I’m asked to elaborate, and so I do. As we look into some Bible contexts, consider this. Let’s just look at it as ‘literature’… like Alice in Wonderland, War and Peace or a Shakespeare play. There is every color of approach under the sun with regard to the Bible, considered a farce and a lie at one end of the spectrum all the way to the inspired Word of God at the opposite end. Wherever you stand, think of it this way: The Bible is a story. It’s the story of mankind. This might be asking a lot, but try and put your personal feeling and religious upbringing, if any, aside for the time being and take a look at the Bible as a ‘story’, just as you would Alice in Wonderland, War and Peace or Hamlet. All three of these examples are stories. They all have characters in conflict, a goal, a desire, and a plot with adventurous episodes played out by the characters generally climaxing in the attainment of the goal. So does the Bible. 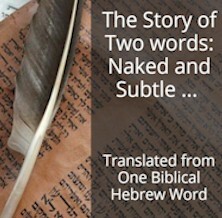 Like a work of literature, having a beginning, a middle and an end, so does the Bible. Galacti warns against giving away that ending–even though this is one aspect of our journey in which Galacti cannot see through time. Although the Bible was, in the beginning, alien to Galacti, he has drifted back in time and watched the scribes copy the Hebrew language Old Testament. Our Bible story proposes two main characters and a secondary player who likes to place himself in the limelight. You have your Good Guy named God, of omnipresent and omnipotent spirit stature, with overwhelming powers. His protégé is almost diametrically opposed, with physically and spiritually weak stature: Humanity. The third role goes to the inevitable villainous Bad Guy: the Devil. He too, like God, is a powerhouse spirit being but with lesser powers than God. A plot wouldn’t be a plot without a villain to play against the hero, and this story is no different. The second character, Humanity, is caught in between God and the Devil. Humanity is used here to represent humankind, all men, women, children and babies that ever lived on planet Earth. Each human being has a role to play both individually and collectively. In the Bible story, man walks a tightrope, trying to keep his balance, sometimes tipping over to God’s side but generally falling into the Devil’s lap. From the opening scene to the finale, the central question is, ‘Will Humanity have a good outcome?’ Other people of faith, such as clergy, might phrase this question as, ‘Will Humanity be ‘saved’? What will be his outcome? Will they live happily ever after? At the end of each act, man is hanging there in expectation–actually fighting the good and bad pulls of his own human nature, trying to keep his balance. On some occasions he’s taken a nosedive, lying prostrate in disarray and has to be helped up to continue his expedition. I wrote this scenario of humankind in Audit of the Universe, the upward urge and the downward drag, the simultaneous filling and emptying of the glass, the never-ending struggle of humanity that has led us into the 21st century and this crucial time in the history of humankind. These are the twists and turns and dramatic reversals of our plot. Galacti, in his role as ‘casting director’, introduces you to each of these characters, their traits and their relationships with each other. You’ll meet them as the curtain rises on the opening scenes. Understanding these characters sets the stage as we take time to introduce them properly. Each plays out his role in this palpitating story of humanity until the drama reaches a stunning and surprising climax and the curtain closes on this episode in the story of the universe. Whether you’ve read the Bible or not, or whatever your feeling about this book, it has ‘characters’, who have a relationship one with each other and there’s a drama being played out. Even from a purely literary point of view. So, just consider it from that point of view and let’s acquaint ourselves with their portrayal, based on the source material: the Book of Genesis in the Old Testament (OT).